A few months ago Yahoo asked me to give the keynote at their internal Front-End Engineering Summit conference. This was a collection of all their front-end engineers from different sites, such as Flickr, the new Ajaxy Yahoo Mail, and more. Yahoo asked that I come in and talk about the next 5 years of the web. 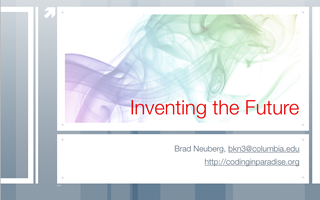 Prediction is hard, especially 5 years in the computer industry, so instead I talked about inventing the future rather than predicting it. Brad Neuberg was asked to give the keynote at the Yahoo 2007 Internal Engineering Summit on the next five years of the web. Instead of talking about the future of the web, he came in and gave a heartfelt speech on invention, inventing the future, and knowing what you stand for. This speech challenges Yahoo to change, goes into the core of invention, and provides techniques for shaking the world up with powerful, new ideas. Become a better software engineer by being an inventive leader. Much thanks to Eric Miraglia of the YUI team for setting the keynote up, helping with feedback, manning the cameras, and helping to mix the digital video. It was a great experience getting to know him; he's a super classy guy. "Coworking" is a relatively new term - it was coined a few years ago by Brad Neuberg, a 31-year-old open-source programmer in San Francisco. "I was working for a start-up, and I really wanted to go into business, but I was afraid I would miss the community and structure of a workplace," he says. So he founded a shared office space in a women's art center, and since then he's become something of a coworking evangelist, encouraging people to start spaces and managing a wiki page with its own blog, links to coworking spaces all over the world, and instructions on how to start your own space. As Neuberg acknowledges, the concept of sharing office space isn't new. But coworking is more than just sharing space, he says. "It's very specifically about creating a community," says Neuberg. "It's like the difference between a coffee shop and a restaurant. At a restaurant, you're there in your own little space; you may have a friend with you, but you're not there to meet people. People at coffee shops are a little more social." In the print edition there is also a sidebar with further info; read the sidebar online. Quick note: the article implies I started the coworking wiki; in fact, this was Chris Messina's idea and action, and it was instrumental in coworking blowing up.